Kabuki is a performing art that began in the early 17th century and which is still performed today. 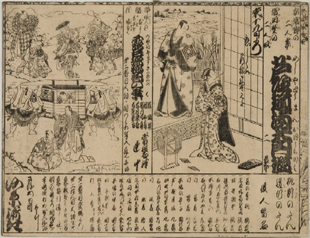 It was particularly vibrant during the Tokugawa Period (1603-1867), when many kinds of professionals - actors, playwrights, stagehands, costumers, printers and publishers, teahouse proprieters, and others - devoted themselves to mounting performances and/or supporting fan interest and activities. Early performances took place in temporary venues, but later, dedicated theatres in urban entertainment districts became the primary sites for kabuki performances. In Japanese theatre history kabuki and the puppet theatre are closely connected. Throughout its history kabuki has borrowed plays as well as acting techniques from the jōruri puppet tradition, and some of the most famous pieces are staged by both traditions.